SloMo Mini is a very compact, professional Instant Replay Controller for up to four video players. 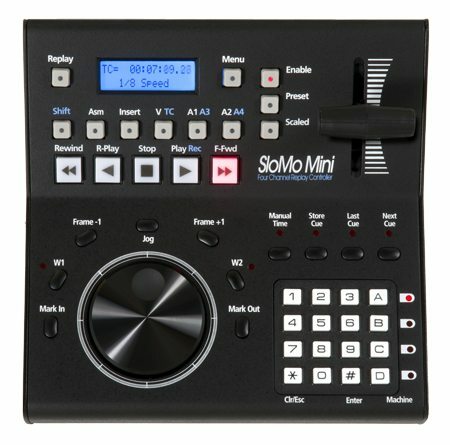 The SloMo Mini is one of a broad JLCooper family of video replay and edit controllers. The JLCooper SloMo Mini is a very compact, fully professional replay controller for up to four video sources – VTRs, DDRs or video servers. Up to 16 sources can be supported with the addition of the JL Cooper Gangway 16 expander interface. It is ideal for use in space-critical situations, such as OB trucks and other vehicles, scoreboard control, QC and transfer suites. The SloMo Mini controls the source machines using standard 9-pin RS422 serial control. A 25-pin breakout control cable is supplied with the unit permitting immediate connection to four video machines. It is ideal for use with AJA KiPro, BlackMagic HyperDeck, Video Devices Pix 270i, FFV Micron/Omega and most video recording devices. 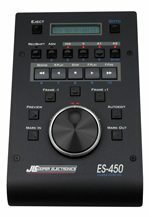 Machine control is via a standard set of transport buttons, plus a highly ergonomic Optical Jog Wheel, with a set of the most often used edit point buttons arranged around it. Assemble, Insert, Crash and Lock Out editing modes are supported. 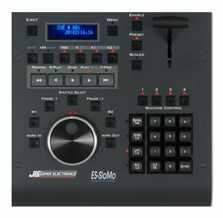 A large T-bar control sets play speed for SloMo and shuttle operation, and the controls also include a set of fast action function keys and a 2 x 16-character backlit LCD display.